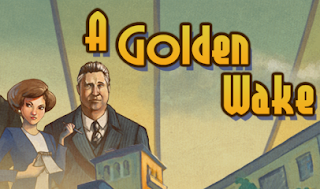 A Golden Wake is a the first commercial adventure game by Grundislav Games, the creators of the popular freeware adventure game series Ben Jordan: Paranormal Investigator. The game follows a real estate salesman who seeks to make a fortune during the roaring 20's in Coral Gables, Florida. The game is based on actual events and features real life locations and historical features. It was released on October 9, 2014 for PC, Mac, and Linux.